We have four fantastic events planned for EDAW 2017 in Edmonton. Thank you to ATB Financial, Edmonton House and the City of Edmonton for agreeing to light up landmarks in purple for the week. What a great week of Events! This event is hosted by the Speaker’s Office and will consist of a short program of speeches by various dignitaries followed by an informal reception in the Lower Rotunda of the Legislature. This event will mark the FIRST TIME the Province of Alberta has declared the week, so we hope you can join us for the historic event! 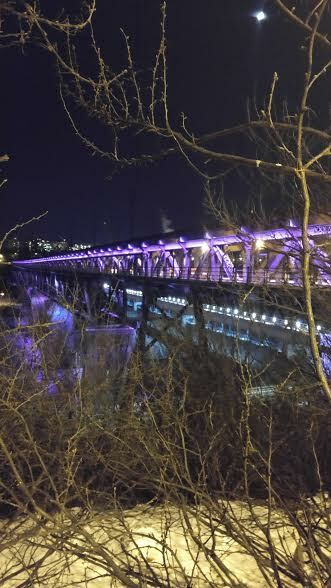 At 7:30 PM, we will walk outside to enjoy Edmonton’s display of support for Eating Disorders Awareness Week, with the High Level Bridge, ATB Building and Edmonton House all light up in purple. Thanks to a partnership with SmartyPantz, #Smash_ED will be done INSIDE for the first time! Bring your bathroom scale and smash it to smithereens in the SMASH ROOM. All protective gear and smashing tools provided. If you don’t have a scale to smash, you can smash one of the ones we have collected. Afterwards, gather a piece of the scale, decorate it and add it to our collaborative art project in the lobby. We will also have another art project needing your input focused on male body image which will be displayed at UnMaskED. All materials supplied. This event is free of charge, but donations will be gratefully accepted. Time: 8 AM – 4 PM. Lunch provided. Cost: $225. Early Bird Rate: $165. Student rate: $90. Offered in partnership with the Eating Disorder Program at the University of Alberta Hospital, this is a rare professional training opportunity for nurses, doctors, psychologists, dietitians, therapists and post-secondary healthcare students to learn about this complex illness. All breakout sessions will be presented by professionals with extensive backgrounds in eating disorders. Please note: This symposium is only open to healthcare professionals and post-secondary students enrolled in a healthcare field of study. The Eating Disorders Symposium is endorsed by Alberta Health Services. ​Cost: FREE, Donations to EDSNA or EMHC appreciated. Offered in partnership with Edmonton Men’s Health Collective, this evening will feature screening a short British documentary called Millstone by the British Organization, Men Get Eating Disorders Too, followed by a panel discussion about male body image and eating disorders. Open to all. A safe space for all genders and identities. ​It’s time to dispel the myth that men don’t get eating disorders. Please share this event with friends on Facebook.